Summary BYOD five-bay Intel D2700 Atom RAID SATA NAS with many serving options. 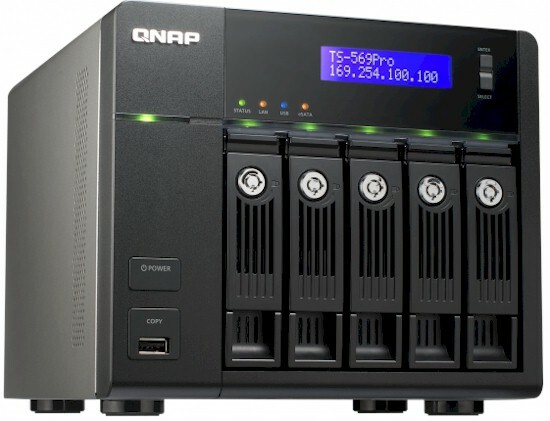 QNAP's TS-569 Pro is a five-bay version of the dual-drive TS-269 Pro I reviewed a few weeks ago. Like its smaller sibling, the TS-569 Pro is a based on Intel's dual-core D2700 Atom processor. From the front side, the TS-569 Pro is almost identical to every other five-bay QNAP NAS, with only the front LCD display giving a clue as to the true nature of the box. A sharp eye might notice that the front panel now has a USB 2.0 port vs. the blue USB3.0 port found on the QNAP TS-559 Pro II. On the rear, things change just a little bit, with the inclusion of an HDMI port (for console access), shuffling around of some ports and that missing blue USB 3.0 port appearing in the rear for a total of two. Removing the cover, the first thing noticeable is the empty SoDIMM socket (Figure 2 below) which can be populated with either a 1 GB or 2 GB DDR3 memory module, bringing the TS-569 Pro RAM complement to a total of 3 GB, fully blessed by QNAP. Like other QNAP NASes, the board is mounted component side in and disassembly required more than what was comfortable. However, a peek down the backside (Figure 3) does reveal the SoDIMM module, which appears to be glued in somehow, seeming to indicate that they don't want you messing with it. You can also see the Flash (Disk On Module) to the right of that. It's not easy to see, but the 2.13 GHz Intel Atom Dual-Core D2700 processor is down there under a black heatsink as are two Intel WG82574L Ethernet phys. We took a logical guess that the Intel NM10 Express chipset is the companion chip to the D2700 that also sits under the same heatsink. USB 3.0 functions are provided by an Etron Tech EJ188G. A look at the TS-569 Pro backplane (Figure 4) reveals the five SATA connectors, which are supported by two Marvell 88SE9125 SATA 6Gb/s and PATA Host Controllers mounted right on the backplane. Table 1 summarizes all the TS-569 Pro's key components. The NAS was equipped for testing with four Seagate ST1000DM005 HD101AJ1 1 TB drives supplied by QNAP. Power consumption measured 46 W with the 4 drives spun up and 27 W with them spun down. Fan and drive noise could be classified as medium-low, with most of the noise coming from the drives. Firmware at test time was 3.7.3 Build 20120801. This version includes the MyCloudNAS feature and ElephantDrive cloud backup option. This version has added another cloud-based storage feature: Symform. Symform lets you allocate a portion of your QNAP NAS in return for free cloud storage. It's also available for Windows, MacOS and Linux (beta) systems so you can share some of your storage there. Synology also recently added support for Symform. We'll be doing a review of standalone Symform shortly.